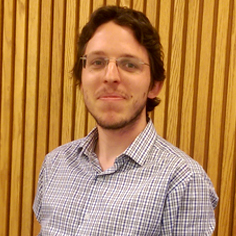 Sebastien Vasey, who earned his doctorate from Carnegie Mellon University’s Department of Mathematical Sciences in May 2017, has been awarded the Sacks Prize by the Association for Symbolic Logic for his dissertation. The annual international prize recognizes "the most outstanding doctoral dissertation in mathematical logic." Vasey conducts research in model theory, one of the main branches of mathematical logic. He won the award for his dissertation titled "Superstability and Categoricity in Abstract Elementary Classes,” which he completed under the direction of Professor of Mathematical Sciences Rami Grossberg. In his thesis, the prize committee noted, “Vasey undertook a deep and sustained study of classification theory for abstract elementary classes. The Sacks Prize was founded in 1994 to honor noted logic researcher Gerald Sacks of Harvard and MIT. Sacks was known for serving as an advisor to many Ph.D. students. Vasey shared this year's prize with Matthew Harrison-Trainor, a postdoctoral fellow in mathematics at Victoria University of Wellington. Last year, Vasey was a recipient of the Guy C. Berry Graduate Student Research Award. He is currently a Benjamin Peirce Fellow in the Harvard University Department of Mathematics.